1/2 - 1 small onion I have some family members who aren't fans so I only do a 1/2 of one and chop pretty small. Set IP to saute Throw in chopped onion and mushrooms. Saute until onions are translucent and mushrooms are tender. place the chicken into the baggie and gently shake until chicken is coated. 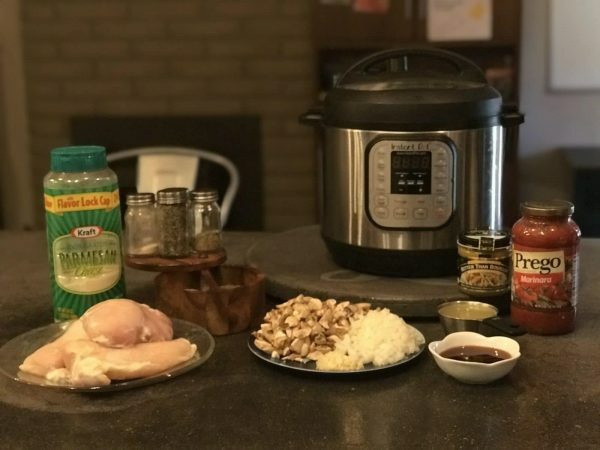 Now here is where I would like to tell you to just brown the chicken in the Instant Pot.. however when I try to do this, it never ends well.. the coating sticks to the bottom and then begins to burn... I find it's just easier to get a frying pan out and brown the chicken a couple minutes each side. 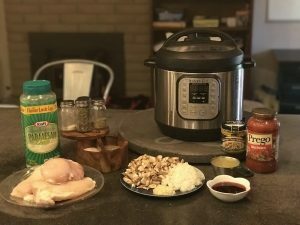 While chicken is browning on the stove you can start adding the parmesan cheese, crushed garlic, marinara sauce, chicken broth, and red wine to the IP. Mix it up and add just a pinch of pepper and salt, remember you can always add more later. transfer the chicken to the IP and cover it with the sauce. secure the lid and make sure the valve is set to seal. Set to manual for 11 minutes. While this comes to pressure (took about 10 minutes) and cooks, you can prepare some noodles and bread.. or whatever you want to serve with it. When cooking is done, let it Naturally Pressure Release (NPR) for 5 - 10 minutes. Smother it in mozzarella cheese and more Parmesan before serving. Serve with Pasta and bread!